Mountains, lakes and wineries…not a bad combination! So there were two choices 1: to cross into Chile from Esquel and then travel north through Chile or 2: to stay in Argentina and travel north through the lake district and onwards. We chose option 2 for a multitude of reasons but main ones being the road networks are better in Argentina, Chile is the 2nd most expensive country in S. America after Mexico so best not to arrive too early, and, perhaps most influential, we would pass through Mendoza which has great wineries and opportunities for numerous tastings! So just 5 hours on the bus and we arrived in Bariloche on Monday at lunch time. For bus entertainment, it was a film with Ashton Kutcher in it this time called ‘Killers’- a mix between Mr and Mrs Smith and Hot Fuzz! It passed the time none the less! The bus terminal in Bariloche is right on the edge of town, around 15 minute bus journey from the centre. So if you know when you are gonna leave and to where, it’s a good idea to buy your onward bus ticket whilst your there. To get into central Bariloche it’s really simple, bus numbers 10, 20, 21 or 22 all go into Centro Civico and cost 6 pesos. Well what to say about Bariloche. 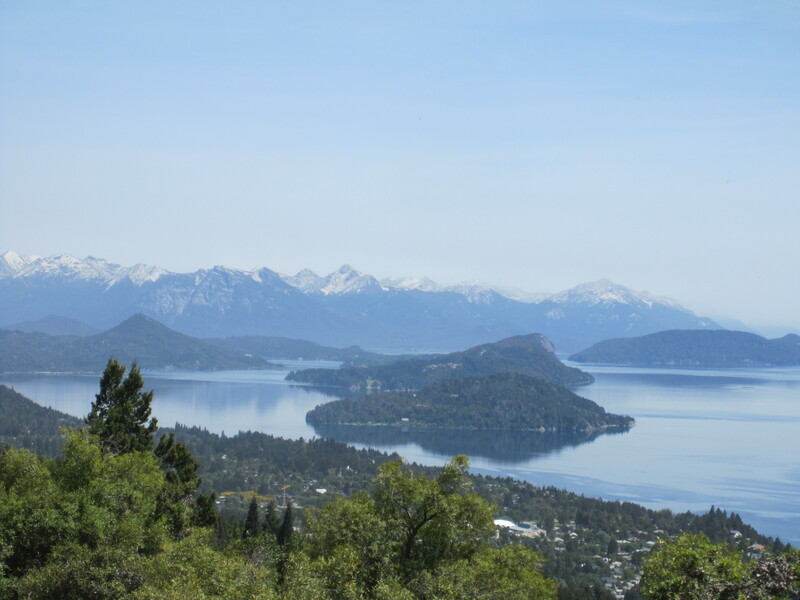 It´s known as the capital of the Argentinean Lake District as it’s the biggest city in the area and is situated right on the banks of a MASSIVE lake called Lago Nahuel Huapi. 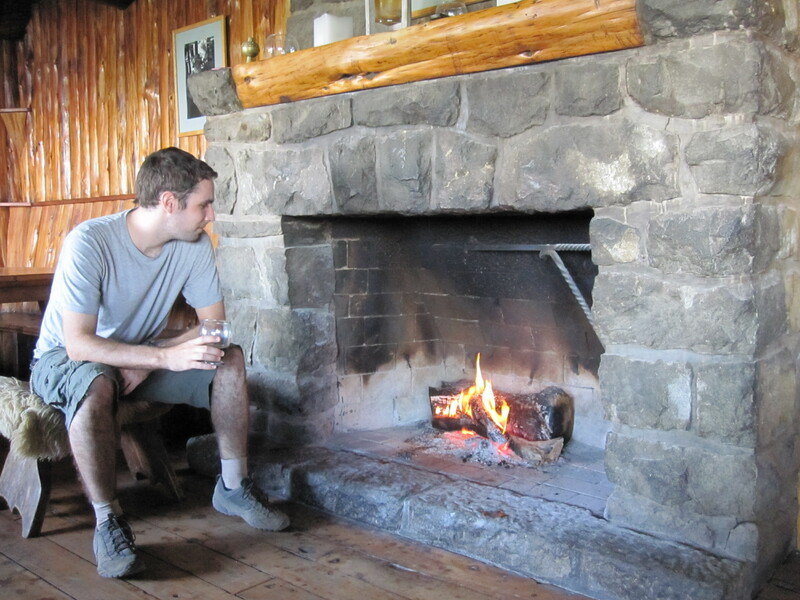 You can see the Andes surrounding the lake and there is a really chilled out feel to the place. We stayed at a hostel called Achalay, just 2 blocks from Centro Civico. We were really impressed with it, and the owners Pabilo and Flora couldn’t do enough for you (including supplying homemade empanadas and pizza when we arrived-yum!). The city has had a bit of a rough time recently and only just recovering from being covered in ash after Volcano Puyehue blew over in Chile in June. By the sounds Chile got off scot-free and the pacific wind blew all the ash clouds over into Argentina oops! After Bariloche got covered in thick ash, it rained for 5 days solid and turned all the ash in the street, roofs, drains, pipes into concrete. One of the roofs at our hostel collapsed with the weight! But the city looks great now and they only very occasionally just a light shower of ash when the wind is blowing right. Mother nature eh! On Tuesday we walked up Cerro Otto and had an amazing view 1405 meter up of the lake and mountains. It’s the shortest walk you can do from Bariloche (2 hours there, 1 1/2 hours back). Hedd’s leg wasn’t great from the sciatica so we took it easy, but all these small treks are good prep for our 4 day Inca trek in Peru at the beginning of December. The views on the way up were brilliant. Lago Nahuel Huapi is so so big and has little islands within it. The pic above was taken from the panaramic point at the top- gorgeous! There was a refuge at the top too called Refuge Berghof which sold drinks and snacks and we chilled there, having lunch, reading our books and taking in the view. The refuge had loads of old expedition memorabilia inside- photos, journals and walking equipment. Looking at the maps I think there are a series of old refuges across this part of the Andes, together called ‘Club Andes’. The area is renowned for its climbing and you can walk or climb to all of them. The most famous being Refuge Frey- but that was a 6 hour hard trek up hill so we decided to give that a miss this time! Whereas Trevelin and Gaiman had a heavy Welsh influence. Bariloche had a Swiss feel. There is a Swiss colony 30 mins East of the city on Lago P. Merono Este and you can see the influence quite heavily in the town of Bariloche- there are lots of restaurants selling Fondue and loads of chocolate shops with St Bernard dogs in the window! The scenery is quite Swiss looking so I can see why some of the Swiss immigrated over here back in the day. On Wednesday, our last day in Bariloche, we took a stroll around the town again and visited the Cathedral called San Carlos de Bariloche. Built in 1946, it had some impressive stone arches inside and great stained glass. Well worth a visit. After a bit more lazing about and a healthy lunch of ice cream (!) we boarded our next bus north- the 15.30 departure overnight bus to Mendoza. So after 17 1/2 hours on the bus with no sound for the first 8 hours (its amazing how much you can get into films with no sound and just spanish subtitles! ), we were quite relived to arrive at Mendoza bus terminal on Thursday morning. Although the last hour of the bus journey we were travelling through all the vine yards with the snowy Andes in the background which was quite spectacular. So Mendoza is a city- the biggest place we´ve visited since Buenos Aires- and like Bariloche, if you know when and where you are heading next, its worth getting your onward bus ticket whilst you’re at the terminal so you don´t have to trek back there during your stay (30 min walk from the central plaza). We got a taxi from the terminal to our hostel (17 pesos) but there are frequent buses too. We stayed at Hostel Empedrado who´s tag line is ´hostel and wine´and they didn´t let us down! You got a big free glass of red wine every night and the first night we were there they ran a free wine tasting which 1 red, 1 white and 1 dessert wine which went down very nicely. The receptionist Ana is fantastic, knows everything and speaks perfect english. The bathrooms are a bit tired and water temperature is temperamental but the positives about the place outweighed those negatives. Thursday during the day we just explored the city and went to a little wine tasting at a vinerie (wine shop) called Sastre Burgos. Its 2 blocks up from the main plaza on Avenida Mitre. It cost 20 pesos and we tried around 10 different wines. Really good value for money, although it was a lot more red wine drinking than I´m used to! I got a bit home sick that afternoon as shops in Argentina are just starting to put out their Christmas displays in the windows and it got me to thinking about the lead up to Christmas which I absolutely love! But it’s not everyday that you´re travelling around the world so I have kept reminding myself of that. But at home you better be dusting off that tinsel for me and drinking my share of Mulled Wine! GB is a Christmas fairy short this year! 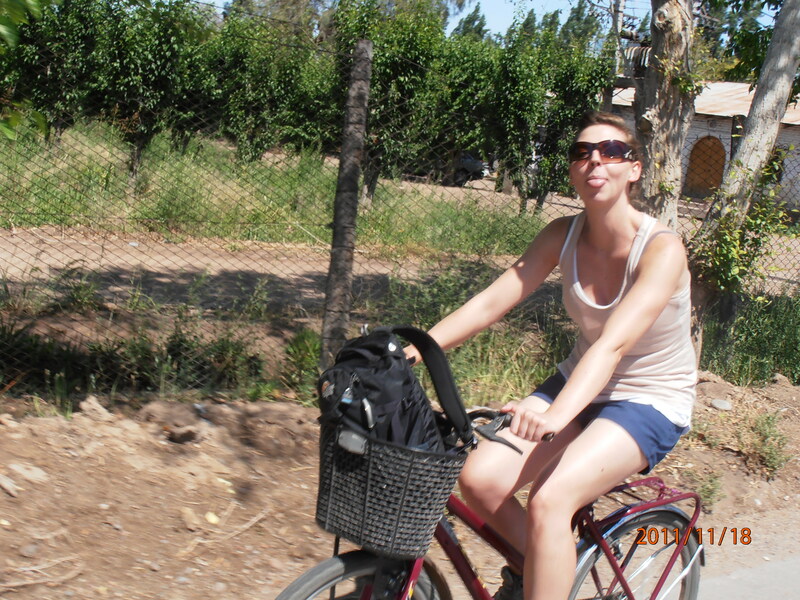 Yesterday we had the most fantastic day biking around the Maipu wine region and stopping off in the numerous wineries for tours and tastings. The weather was stunning and after 45 minutes on the local bus (line 10, number 173; cost 1.80 pesos), we arrived at Mr Hugo´s bike hire on Urquiza street in Maipu. This wife and husband run bike hire is great fun. They don´t speak a word of english but kept calling us chico´s (kids) and giving us cups of red wine! We eventually got 2 bikes (30 pesos each for the day) and a map of the area and headed off, rather gingerly, to our first winery. Our first stop was Trapiche winery. It’s a big one but one with history and exports quite a lot to North America and all the countries in South America. We got there just in time for an english speaking tour with 2 other couples from Minnesota. Our guide was really knowledgeable but with a good sense of humour too and we got shown all the various stages of wine making, the grounds and then the tasting at the end. It cost 30 pesos and we got to taste 4 different high-class reds. We soon realised that the whole day will just be red wine and for non red wine drinkers this was quite daunting but we soon got over that and got stuck into the red. The Maipu region is renowned for their red wine called Malbec- a very powerful, smokey red- and we tried many Malbec´s throughout the day. The story goes that the Malbec grape originally came from France and the French called it ´Bad Mouth´as they thought it wasn´t very nice. An agricultural disease then spread across France, almost wiping out the Malbec grape. But some vines were exported to Argentina where the climate was perceived to be more favourable and so the grape wouldn´t be lost. And the Argentinians have loved it ever since. It goes very well with red meat, which Argentinians also eat a lot of, so I can see why they love it so much. We then cycled 10 k south to a winery called Familia Di Tommas which was a complete contrast to Trapiche as it was small, family run and more artisan. It had a really homely feel and we got 20% off with our Mr Hugo bikes so only 16 pesos for this tour and tasting. This time we tried 3 reds and 1 dessert wine. The dessert wine was extremely sweet but a nice change after the reds! We had our picnic lunch within the vines and bought a bottle of white to take back with us. 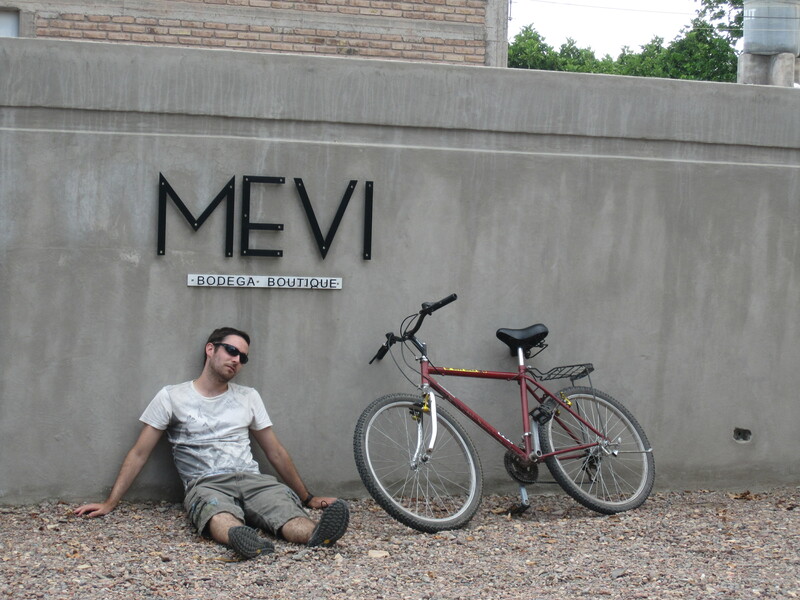 Next stop was Mevi winery which was different again as it is only 9 years old. We tried the young wines option which included a chardonnay (25 pesos) and relaxed on their sun terrace overlooking the vine yards and the Andes in the background. We were quite ´squiffy´by this point but surprisingly the cycling got easier the more you drank (!) which is a good thing as we then had the 10k cycle back to the start of the wineries to visit a chocolatiers, liquor and olive oil making place. I must have devoured half a basket of bread dipped in olive oil and balsamic vinegar before the guide could finish telling us about the produce! Plus the chocolate…it really hit the spot after a day on the wine! The liquors though, jee whizz, they were strong! I had an irish cream one which I couldn´t finish and then a pineapple one which wasn´t too bad. The day ended back at Mr Hugo´s bike hire, with another complementary cup of wine! I can´t stress enough what a ´ledge´ (´legend´) Mr Hugo was. All the travellers who had hired his bikes that day head back to his place at 6pm when the wineries shut and then he holds a bit of a party with more wine and music. It was really good fun, and we met even more people from Minnesota! Then it was the number 173 bus back to Mendoza, 15 min walk to the hostel, more free wine, food and then major crash into bed! Great day! So today is Saturday and we have to say bye to Mendoza. We headed to the cities big park called Parque Gral. San Martin and walked around the lake there. They have a water sports club on the lake and I saw a man single sculling in the lake- the first rowing I´ve seen this trip. He was in a really wide and old wooden single with wooden oars….maybe our kit at Royal Chester (my rowing club in the UK) isn´t so bad! We´re not only saying bye to Mendoza but also Argentina, our first country of 13 on this 5 1/2 month trip. Argentina is really a beautiful country and has treated us well. But onwards we go into Chile on a 12 hour night bus to a seaside town called La Serena. Fingers crossed the border crossing won´t be too awkward! Drink= Malbec Vino Tinto ( Malbec red wine) of course! An idiosyncrasy= The local buses don´t take notes, only coins (very inconvenient), try to get a bus card which you can load with money at the bus station when you arrive. You can also top these up at most kiosks around the city too. This idiosyncrasy is common throughout Argentina, we managed to swap our bus card for Gaiman for one for Mendoza with a South African couple travelling South whilst in Bariloche. Worth an ask! Not exactly words of wisdom this time, but more of a reflection on wine. For those of you who know me well, there are two alcoholic drinks that I never drink – Beer and Red Wine…well after the last two days, i might have to amend that list. I still won´t be ordering a pint in the pub, but I might enjoy a glass of red wine with a meal from now one. This might come as a shock to my Dad in particular since I´ve always described his red wines as ´tasting like vinegar´but maybe that´s just his taste in wine. I thoroughly enjoyed the wine tours and enjoyed quite a few red wines…my favourite being a 50/50 blend of Malbec and Merlot, which we got at the Trapiche vineyard. Helen says I have expensive tastes as that one cost 240 pesos per bottle, the most expensive one we tried, but who cares, it was the nicest.